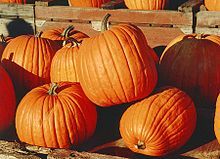 Pumpkins are a gourd-like squash of the genus Cucurbita and the family Cucurbitaceae (which also includes gourds). The name commonly refers to cultivars of any one of the species Cucurbita pepo, Cucurbita mixta, Cucurbita maxima, and Cucurbita moschata. They typically have a thick, orange or yellow shell, creased from the stem to the bottom, containing the seeds and pulp. I was something that lay under the sun and felt it, like the pumpkins, and I did not want to be anything more. I was entirely happy. Perhaps we feel like that when we die and become a part of something entire, whether it is sun and air, or goodness and knowledge. At any rate, that is happiness ; to be dissolved into something complete and great. Willa Cather, My Ántonia (1918), p. 18. We fancy men are individuals; so are pumpkins; but every pumpkin in the field, goes through every point of pumpkin history. Ralph Waldo Emerson, Essays (1850), p. 236. Henry David Thoreau, Walden (1854), p. 60. If I could be a vegetable, I'd be a pumpkin. It's realistically the only vegetable you can use as a weapon, or in any manner of defense. Chris Walla , 20 questions with Christopher Walla (2000). Quotes reported in Hoyt's New Cyclopedia Of Practical Quotations (1922), p. 649. Through orange leaves shining the broad spheres of gold. John Greenleaf Whittier, The Pumpkin.